Philip Sawyers’s Third Symphony is a major new work from a distinctive voice in British music. Sawyers was formerly a violinist in the Royal Opera Orchestra, but has been a full-time composer since 1997. His music has been championed by the Nimbus label, and by Kenneth Woods and the English Symphony Orchestra; orchestra and conductor have previously recorded the Second Symphony for the same label (with the First also available, performed by David Lockington and the Grand Rapids Symphony). Sawyers is currently John McCabe Composer in Association with the English Symphony, so expect further collaborations. The Third Symphony was an English Symphony Orchestra commission, and Kenneth Woods encouraged Sawyers to expand his orchestral palette, from the Mozart-sized orchestra of the Second Symphony, to a larger ensemble. Sawyers has risen to the challenge, producing a 40-minute work on an impressively grand scale, with the large brass and woodwind sections well-integrated into the music’s conception. 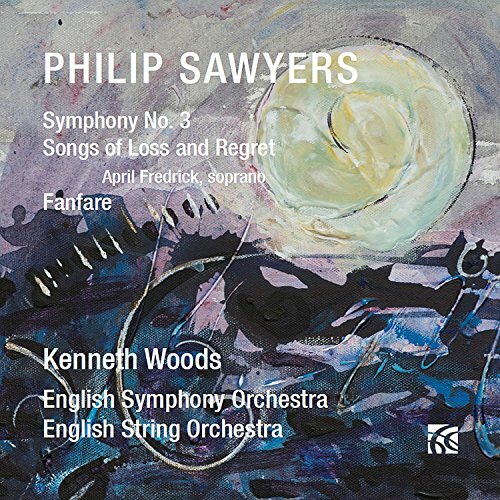 Sawyers is clearly a product of the 20th-century English symphonic tradition, with Robert Simpson and Havergal Brian obvious predecessors. Like Simpson, Sawyers combines elements of Bruckner, Sibelius and Nielsen—the Sibelius most apparent in the recourse to weighty bass pedals, the Nielsen in the sprightly third-movement Intermezzo. But Sawyers also leans towards Mahler, particularly in his Adagio second movement, which opens with what almost sounds like a quote from the Ninth Symphony, a swooping upward octave in the violins, though it soon goes its own way. Technically, the music is a mix of post-Romantic harmony and serial technique. The first movement opens with a 12-tone theme, which is rigorously developed, although elsewhere shorter motifs are subject to similar manipulations, and within a broadly tonal context, so more Brahms than Schoenberg. The upbeat finale owes more than a little to Walton’s First, not least the plaintive trumpet solo mid-way, and also the affirmative closing gestures. But all these influences are well-integrated into a work of impressive symphonic unity and drama. I was at the premiere of the symphony, by the same forces at St. John’s Smith Square in February 2017, a well-attended and well-received performance. It was billed as the first in a series entitled The 21st Century Symphony Project. The project is headed by Kenneth Woods, who plans to commission and perform nine new symphonies over the coming years, and already has David Matthew’s Ninth penciled in for the spring of 2018. Given the conductor’s zeal, a commercial recording of that is a fair bet. This recording is not of the premiere, it was made in the studio (Wyastone) shortly before—yet another indicator of the care with which Woods prepares his projects. The performance is good, with Woods finding all the drama in the music, but without laboring the sometimes terse tuttis. The English Symphony Orchestra could do with a few more desks of strings—though it is a financial miracle that the recording happened at all, so that’s a minor grumble. The lower brass and timpani sound a little recessed, which I’m inclined to blame on the recording, as they sounded fine live. Otherwise, this recording does the new symphony proud. The program continues with a song cycle, Songs of Loss and Regret, and a Fanfare, both of which were also performed at SJSS, the Fanfare written specially for the event. Both are in a more openly diatonic style, the song cycle pastoral, perhaps, although its bleak string textures again tending toward Nordic models. The big draw here is April Fredrick, a young and versatile soprano who has worked extensively with Woods and the English Symphony (she sings the title role in their recording of John Joubert’s Jane Eyre, Somm 263-2, another very impressive premiere on disc). Sawyers makes emphatic use of his texts, poems from Housman, Tennyson, and others, and Fredrick clearly intones every line, her distinctively English tone and accent proving ideal. The Fanfare is an occasional piece, which worked well at the premiere, where the brass choirs where positioned antiphonally on transept balconies. It is little more than filler here, but a welcome filler nonetheless. All round, then, an excellent introduction for Philip Sawyers’s new symphony, and for Kenneth Woods’s commissioning project. The mind boggles at the financial challenges such undertakings must face, but the English Symphonic Tradition seems to have many passionate advocates, not least the record label, conductor, and orchestra presented here. Its future looks bright. This review appears in Fanfare magazine issue 41:3.